Course assignment for students enhance Wikipedia entries on the Everglades by refining the written entries and adding primary resource materials from the University of Florida Digital Collections (UFDC). The primary resources in UFDC are in the digital collection, Americaâ€™s Swamp: the Historical Everglades (http://ufdc.ufl.edu/swamp). Everglades resources on Wikipedia can be found by searching Wikipedia and working through the links from Wikipediaâ€™s entry for the Everglades (http://en.wikipedia.org/wiki/Everglades). Using these resources, investigate important information related to the Everglades on Wikipedia. In researching the available information, keep in mind: What topics aren't covered on Wikipedia that need to be? Or, what topics aren't covered thoroughly enough on Wikipedia? What topics could be enhanced with images from and links to the UF Digital Collections? 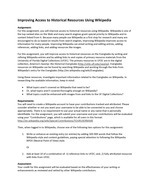 For this assignment, you will improve access to historical resources using Wikipedia. Wikipedia is one of the top ranked sites on the Web and many search engines grant special priority to Wikipedia and to content linked from it. Because many people use Wikipedia as a first stop for research and many are encouraged to do so based on results from search engines, improving Wikipedia improves access to information for many people. Improving Wikipedia can entail writing and editing entries, adding references, adding links, and adding resources like images. For this assignment, you will improve access to historical resources on the Everglades by writing and refining Wikipedia entries and by adding links to and copies of primary resource materials from the University of Florida Digital Collections (UFDC). The primary resources in UFDC are in the digital collection, America's Swamp: the Historical Everglades (http://ufdc.ufl.edu/swamp). Everglades resources on Wikipedia can be found by searching Wikipedia and working through the links from Wikipedia's entry for the Everglades (http://en.wikipedia.org/wiki/Everglades). What topics aren't covered on Wikipedia that need to be? Or, what topics aren't covered thoroughly enough on Wikipedia? 1. Write or enhance an existing entry (or entries) by adding 300-900 words that follow the Wikipedia style and content guidelines, paying special attention to following the Wikipedia NPOV (Neutral Point of View) style. 2. Add at least 10 of a combination of: 1) reference links to UFDC; and, 2) fully attributed resources with links from UFDC. Your credit for this assignment will be evaluated based on the effectiveness of your writing or enhancements as reviewed and vetted by other Wikipedia contributors. Improving Access to Historical Resources Using Wikipedia Assignment: For this assignment, you will improve access to historical resources using Wikipedia Wikipedia is one of the top ranked sites on the Web and many search engines grant special priority to Wikipedia and to content linked from it. Because many people use Wikipedia as a first stop for research and many are encouraged to do so based on results from search engines, improving Wikipedia improves access to information for many people. Improving Wikipedia can entail writing and editing entries, adding references, adding links, and adding resources like images. For this assignment, you will improve access to historical resources on the E verglades by writing and refining Wikipedia entries and by ad ding links to and copies of primary resource materials from the University of Florida Digital Collections (UFDC). The primary resources in UFDC are in the digital collection, ( http://ufdc.ufl.edu/swamp ). Everglades resources on Wikipedia can be found by searching Wikipedia and working through the links from Using these resources, investigate imp ortant information related to the Everglades on Wikipedia. In researching the available information, keep in mind: What topics aren't covered on Wikipedia that need to be? Or, what topics aren't covered thoroughly enough on Wikipedia? What topics could b e enhanced with images from and links to the UF Digital Collections? Requirements: You will need to create a Wikipedia account to have your contributions tracked and attributed. Please consider whether or not you want your username to be able to be connected to you and choose appropriately. There is no requirement to use your actual name or any name that is personally identifiable. For the assignment, you will submit your username and your contributions will be evaluated http://en.wikipedia.org/wiki/Special:Contributions/YOURUSERNAME Then, when logged in to Wikipedia, c hoose one of the following two options for this assignment : 1. Write or enhance an existing entry (or entries) by ad ding 300 900 words that follow the Wikipedia style and content guidelines, paying special attention to following the Wikipedia NPOV (Neutral Point of View) style. Or 2. Add at least 10 of a combination of: 1) reference links to UFDC ; and 2) fully attribut ed resources with links from UFDC Assessment: Your credit for this assignment will be evaluated based on the effectiveness of your writing or enhancements as reviewed and vetted by other Wikipedia contributors. 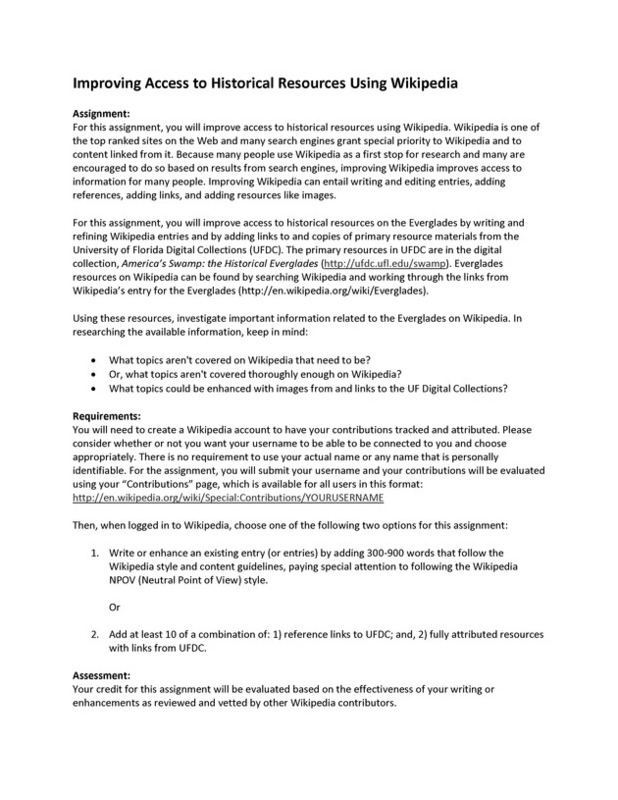 Improving Access to Historical Resources Using Wikipedia Assignment: For this assignment, you will improve access to historical resources using Wikipedia. Wikipedia is one of the top ranked sites on the Web and many search engines grant special priority to Wikipedia and to content linked from it. Because many people use Wikipedia as a first stop for research and many are encouraged to do so based on results from search engines, improving Wikipedia improves access to information for many people. Improving Wikipedia can entail writing and editing entries, adding references, adding links, and adding resources like images. For this assignment, you will improve access to historical resources on the Everglades by writing and refining Wikipedia entries and by adding links to and copies of primary resource materials from the University of Florida Digital Collections (UFDC). The primary resources in UFDC are in the digital collection, AmericaÂ’s Swamp: the Historical Everglades ( http://ufdc.ufl.edu/swamp ). Everglades resources on Wikipedia can be found by searching Wikipedia and working through the links from WikipediaÂ’s entry for the Everglades (http://en.wikipedia.org/wiki/Everglades). Using these resources, investigate important information related to the Everglades on Wikipedia. In researching the available information, keep in mind: What topics aren't covered on Wikipedia that need to be? Or, what topics aren't covered thoroughly enough on Wikipedia? What topics could be enhanced with images from and links to the UF Digital Collections? Requirements: You will need to create a Wikipedia account to have your contributions tracked and attributed. Please consider whether or not you want your username to be able to be connected to you and choose appropriately. There is no requirement to use your actual name or any name that is personally identifiable. For the assignment, you will submit your username and your contributions will be evaluated using your Â“ContributionsÂ” page, which is available for all users in this format: http://en.wikipedia.org/wiki/Special:Contributions/YOURUSERNAME Then, when logged in to Wikipedia, choose one of the following two options for this assignment: 1. Write or enhance an existing entry (or entries) by adding 300 900 words that follow the Wikipedia style and content guidelines, paying special attention to following the Wikipedia NPOV (Neutral Point of View) style. Or 2. Add at least 10 of a combination of: 1) reference links to UFDC; and, 2) fully attributed resources with links from UFDC. Assessment: Your credit for this assignment will be evaluated based on the effectiveness of your writing or enhancements as reviewed and vetted by other Wikipedia contributors.